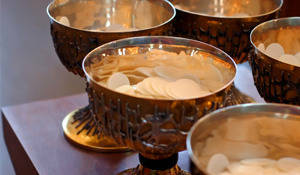 We are a Eucharistic people—brought together each week to share in the mystery that unites us with the Body of Christ. First Communion preparation is incorporated into our Religious Education program for enrolled students. For adults who wish to receive the sacrament of Holy Eucharist, please contact us to learn more about the Rite of Christian Initiation of Adults (RCIA) program.